Information given in this guide will enable you to send page view, product view, add to cart, and purchase behavior to Rejoiner. Rejoiner API v4 introduced new functionality which tracks browsed pages and browsed products. Page view tracking is enabled by default and called whenever our library is loaded. That means, you should place our base snippet on every page loaded by end users to be able to track page views. Tracking product views, however, requires you to call the trackProductView endpoint explicitly. Our base snippet also takes care of collecting other information about an end users behavior on your site. It scans all forms in order to find a customer's e-mail address and associates it with the current order / browsing session. If you want to explicitly set customer data, please check section Storing information about customers. At that point you need to provide your account's data for setAccount (line 3) and setDomain (line 4) - please add your Site ID and Domain into the designated fields. Please remember, that all prices sent to our API should be given in cents ($45.99 => 4599). In order to start a Rejoiner campaign you need information about product abandonment. There are two main endpoints that will allow you to collect cart data: setCartData and setCartItem. Below is the basic product information that you have to send to Rejoiner. You should also call the setCartItem endpoint for each item in the cart. These two endpoints will give Rejoiner enough information to start campaigns, personalize email templates, and generate product recommendations. To let us know when a product(s) has been removed by the user, you can use the removeCartItem endpoint as seen below. Note: You must re-fire setCartData with updated parameters after using the removeCartItem endpoint. After an order has been completed, Rejoiner needs information about the conversion that happened. For tracking conversion you should call sendConversion endpoint on the receipt / thank you page you use on your site to confirm that an user has placed an order or paid for goods. While it's possible to call conversion tracking endpoint without any arguments, we highly encourage you to call sendConversion with cart_data and cart_items parameters filled. The easiest way to convert an order is to call sendConversion endpoint without any arguments, but again we encourage you to send all cart parameters in the call for greater accuracy (see example below). 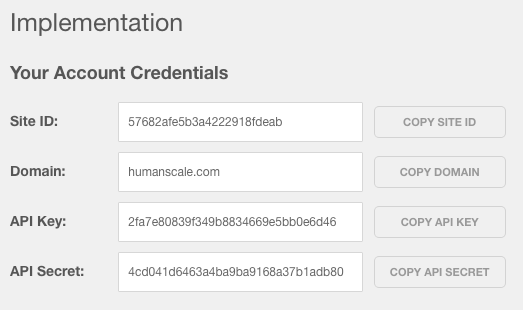 When you use the setCartData or setCartItem API calls, a new order will automatically be created. If for some reason you want to start an order earlier, you can do that by calling the startNewOrder without any params. You can also completely stop current order and its processing by calling the clearCartData endpoint (no parameters required). Calling the clearCartData endpoint will detach the current user session from the last order, stop order processing, and will also stop campaigns associated with that order. Rejoiner API v4 introduced tracking of user activity on site. Each time the library is loaded a page view will be tracked – it will send info to Rejoiner about URL of the webpage where it was loaded. No additional action is necessary. There are situations when we may want to manually track page views. Most common scenario is a SPA application, where there are no reloads when a user is browsing through the application. In order to build better product recommendations for visitors and create browse abandonment campaigns you should push information about the products a visitor was interested in. Examples are: product page, landing page for a new product, comparison page, etc. For each product impression, you can call the trackProductView endpoint, which you can call in a similar fashion to the setCartItem – one call for each product view you want to record. There are two endpoints that will help you send us information about a current visitor. API is located under https://app.rejoiner.com. We don't offer a sandbox environment at the moment, so please be careful. Each Rejoiner user is assigned a pair of keys: API KEY and API SECRET. Both keys are available in the Implementation panel as mentioned in the Preparation section. Each call to our API must be signed by using Hash-based Message Authentication Code (HMAC-SHA1 to be precise). - $request_path is relative and should always start with /, eg. "/api/1.0/site/53b144ad346e71aasb2ed0d9/lead/convert"
Rejoiner's REST API allows you to send conversion information independently of the page being displayed to a user. For example: If you want to wait for confirmation on payment and send information about conversion after payment is accepted, you can use our endpoint for converting a lead. String Promotional code for this order. Additionally, one of the optional parameters may be specified to target one or multiple campaigns (for example, when a post-conversion campaign has a different goal than the abandonment campaign). For post-conversion campaigns, the conversion will only occur if the campaign was in progress. Note: Full REST API technical documentation can be viewed here.